Long ago, silver dollars were hammered, stamped and edged to make oval or disc shaped decorations for saddles, bridles and jewelry. These early conchos became decorations for belts when copper loops were attached to the back to allow them to slip onto a leather belt. 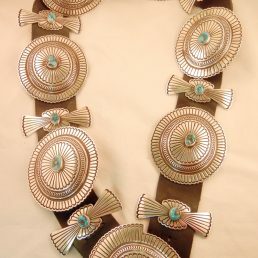 Conchos for leather belts and belt buckles have long been part of the Navajo Indian jewelry tradition, and with bolo ties, characterize the Western style. Palms Trading Company carries a wide selection of Western belt buckles and concho belts that can add a Southwestern flare to any outfit. 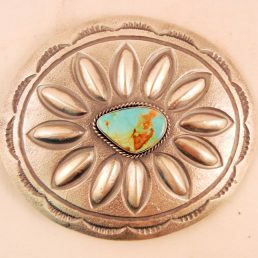 All belt buckles and concho belts at Palms Trading Company are sterling silver and authentic—hand-stamped by Southwestern Native American Indian artists. Palms Trading Company carries two varieties of concho belts—leather and link. Many of our concho belts have the alternating oval and “butterfly” designs. 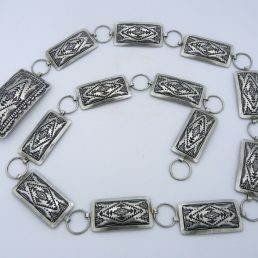 Like belt buckles, the concho belts may be stamped silver with or without stones. 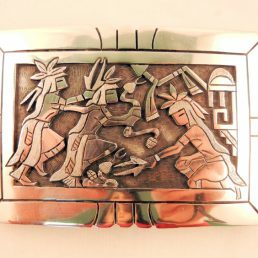 We carry traditional Western style belt buckles with and without stones as well as more contemporary sandcast pieces that vary in shape. The openness of these sandcast buckles allows the leather belt itself to accent the piece’s design. For link concho belts, spacing is fixed and sizing is easy. There is usually a clasp that can be fastened around any link, allowing you to size the belt to fit you. 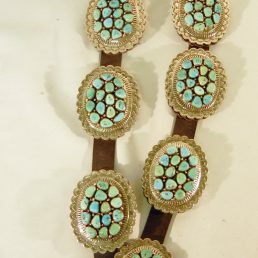 Extra conchos and link length hang down, which is quite stylish with long tunics or blouses. For leather belts, additional holes may need to be punched or extra length cut off to get the belt to the right size. 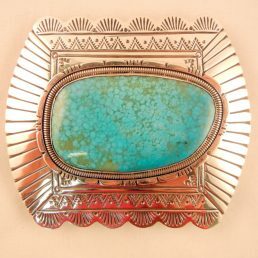 (The Native American Indian artists who design the belt buckles and conchos do not adhere to standard sizing or take custom orders). Once the leather belt is fitted, conchos can slide so you can evenly space them. 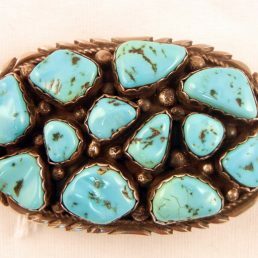 Many of the Native American Indian belt buckles and concho belts use the “tongue” fastener. However, traditional Western style belt buckles are solid and have a prong on the back to fit in a hole in the leather belt. Many of the contemporary designed sandcast belt buckles use the Western style for fastening. If the belt buckles and conchos online don’t strike your fancy, our personal shopper can help you find what you’re looking for in our store without coming to the store. To get started, just contact us! 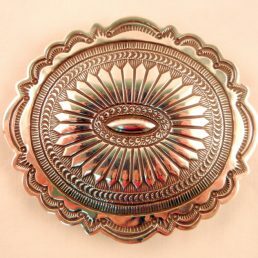 Once you’ve found the perfect Western-style belt buckles and conchos, keep your pieces looking like new by following Palms Trading Company‘s tips for care of your sterling silver jewelry.